If you know how to cut, rout, or nail wood you'll know how to cut, shape, fasten, and finish cellular PVC using standard carpentry tools. Both Versatex and CertainTeed provides the superior workability of wood without warping, cupping, or splitting. Okay, it's not your father's finger-jointed pine or redwood. But how would you approach the job of exterior trim on a house if moisture wasn't a consideration? It may sound simple, but it removes a big decision, and adds an amazing amount of design freedom. For a small fee, we can cut down your material into strips or panels. Cutting down these sheets greatly reduces shipping and packaging cost. It's hard to believe, but most of the installation techniques used for wood are the same for PVC trim, and PVC has a long list of advantages over wood and wood-based composites, there are still lots of contractors resisting the transition. You may be one of them. But, armed with a new understanding of the simple differences, contractors can switch over to Cellular PVC trim with confidence and great success. We're here to help clear the air, and make either Versatex or ViLUX premium free rise PVC believers out of you. 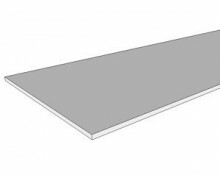 Our PVC sheets come with both sides smooth but the ¾" x 4' x12' comes with a wood grain texture on one side and the other side is smooth. We can special order if you have the lead time. 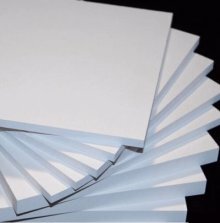 Cellular PVC Sheet White, Smooth Both Sides ⅜"
Cellular PVC Sheet White, Smooth Both Sides ½"
Cellular PVC Sheet White, Smooth Both Sides ¾"
Cellular PVC Sheet White, Smooth Both Sides 1"